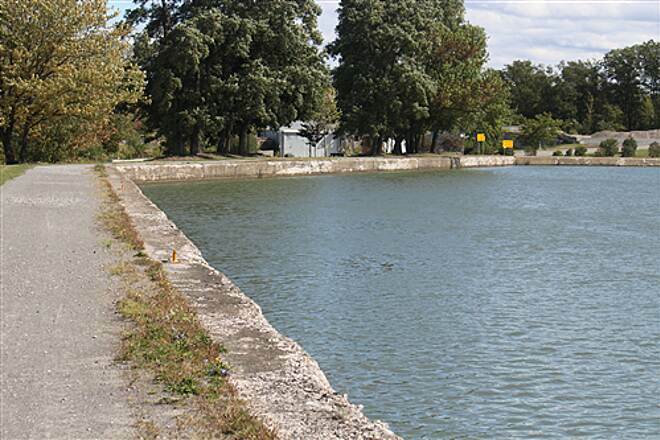 When complete, the Erie Canalway Trail will run for 360 miles in upstate New York—from Buffalo in the west to Albany in the east—linking many other communities along the way, including Rochester, Syracuse, Rome, Utica, and Schenectady. It currently comprises more than 290 miles of open trail and has a few remaining gaps. In 2018, a 5-mile gap on the eastern side of the trail was closed when a new section of the trail opened between Pattersonville and Amsterdam. 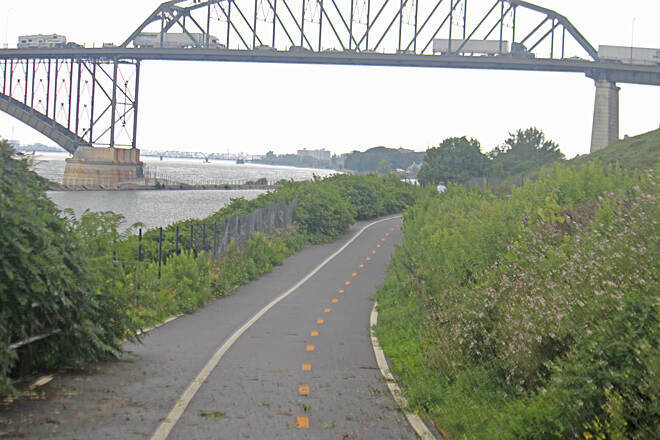 The expansive route is also a part of an even larger trail system, the developing 750-mile Empire State Trail, which will connect trails from New York City to Canada and Buffalo to Albany to create the longest multi-use state trail in the country. 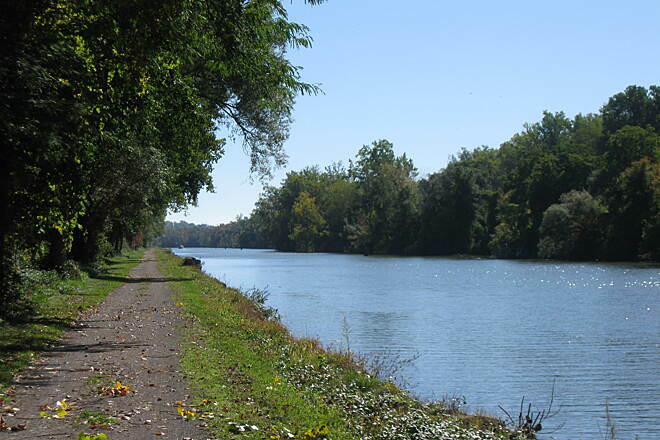 The Erie Canalway Trail follows the Erie Canal, which opened in 1825. 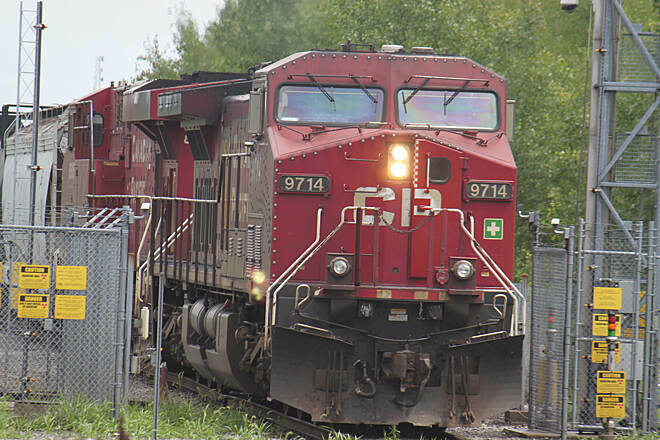 At the time of the canal's construction, railroads were just coming into vogue. 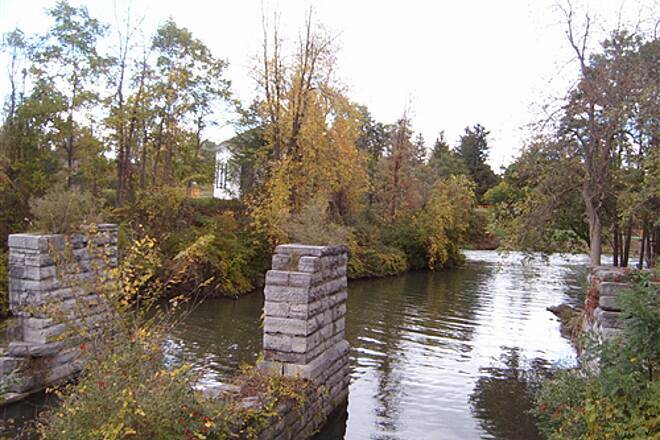 The Mohawk and Hudson, New York’s first railroad, opened in 1831 and ran from Albany to Schenectady. At first, the railroads were seen as competition for the precious canal, so the state’s lawmakers only permitted trains to carry freight during the winter when the canal was closed. But this restriction was soon lifted and, by the late 1800s, trains had clearly won the battle of transportation supremacy. Today, about a third of the Erie Canalway Trail (more than 100 miles) is built on these former railways, largely consisting of the West Shore Line on the trail’s eastern end. 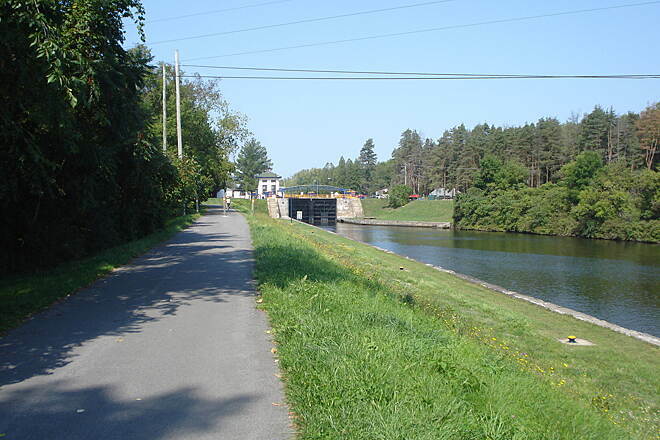 As most of the trail follows these canal and rail corridors, it is nearly level with an average grade of 1 percent. 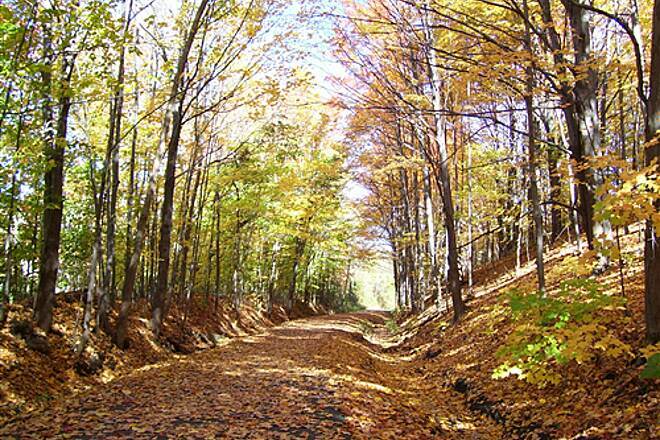 A few steeper grades and hill climbs can be found in the Mohawk Valley section on the trail's eastern half. 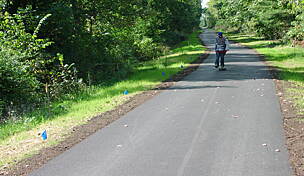 Large sections of the trail are surfaced in stone dust from crushed limestone; however, some stone dust sections are being converted to asphalt paving. 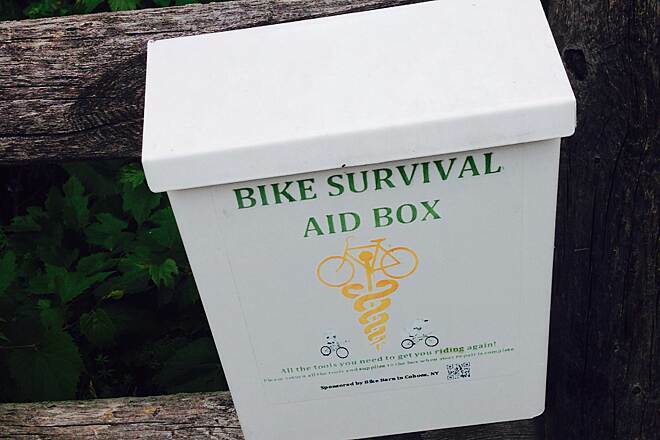 A range of bike types can be used effectively on the trail, including mountain and hybrid bikes, as well as road bikes equipped with wider tires (28 mm or more recommended). 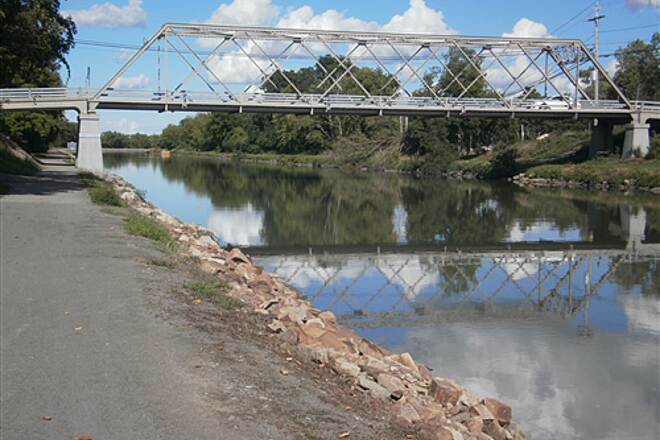 The two longest paved sections are at either end of the trail: from Albany to Schoharie Crossing and from Buffalo to Pendleton. There are a few on-road gaps throughout the trail, but most are easily navigable with trail signage and road markings. The trickiest on-road gap, which may be more difficult for novice riders, is the section through Syracuse. 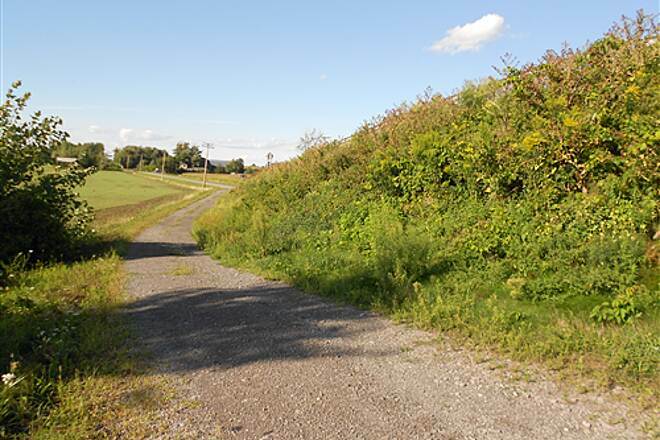 The Syracuse gap is being improved with on- and off-road biking facilities as part of the Empire State Trail project, scheduled to be completed in 2020. 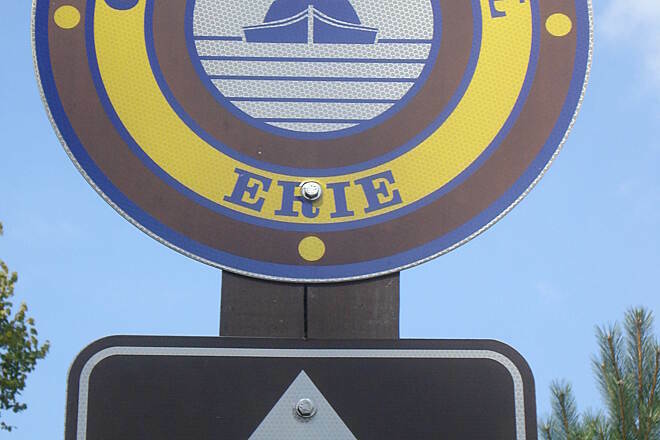 The western segment of the Erie Canalway Trail is also referred to as the Shoreline Trail. It begins in downtown Buffalo and travels about 13 miles north to Tonawanda. 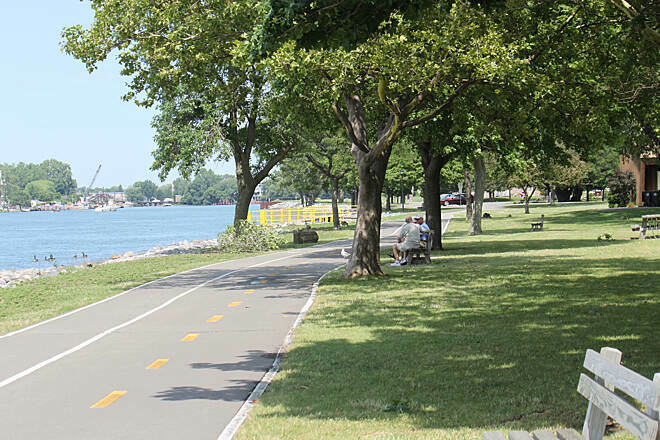 Part of the route includes the Riverwalk along the Niagara River, which is quite scenic and provides access to two popular recreational amenities in Buffalo: LaSalle Park and Riverside Park, both offering athletic fields and places to picnic. 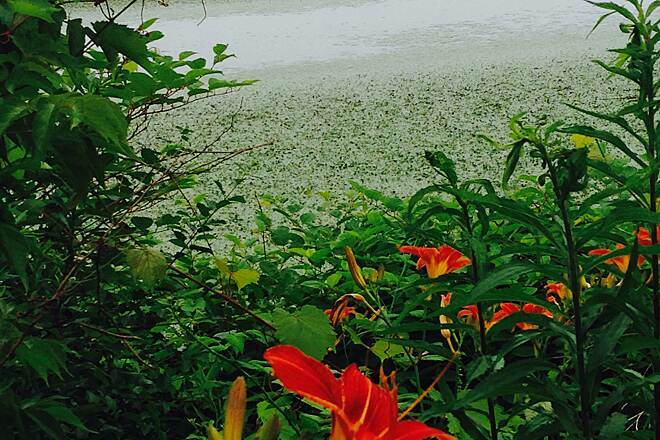 In this section, you'll find overlooks and viewing platforms to stop and enjoy the breathtaking sights of both the Niagara River and Lake Erie. In Buffalo, you can also cross the river into Canada on the Peace Bridge. 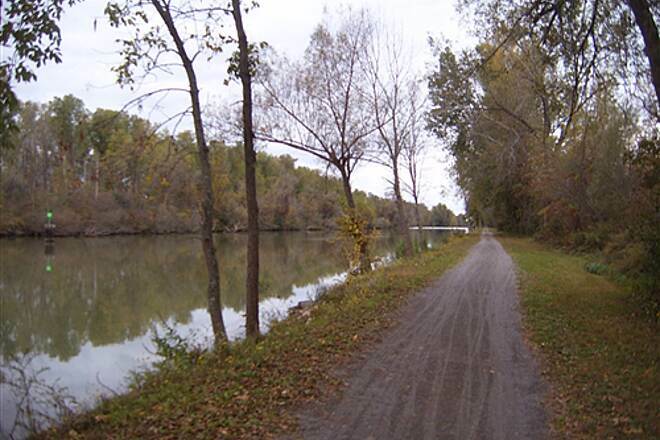 Between North Tonawanda and Lyons, the Erie Canalway Trail continues nearly seamlessly for more than 100 miles. 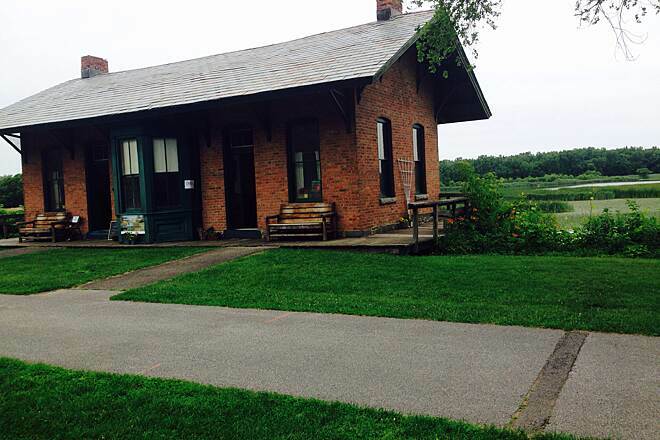 For history buffs, a worthwhile side trip in this section is the Buffalo Niagara Heritage Trail Museum (3755 Tonawanda Creek Road), located just off the trail in Amherst, a suburb of Buffalo. Costumed interpreters and tours of the buildings throughout this 35-acre historical village—including homes, a one-room school house, and working blacksmith shop—provide a tangible sense of 19th-century life here. Plan to spend some time in Lockport as well. To accommodate the 600-foot elevation change from one end of the canal to the other, dozens of locks were built along the waterway. In the city’s famous “flight of five,” you’ll have the unique opportunity to see one of the few remaining original locks alongside a modern working lock. 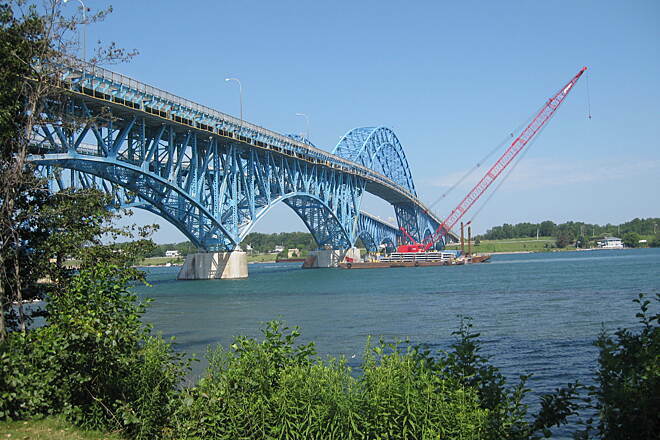 Another unforgettable sight is watching one of the lift bridges raise and lower to accommodate the passage of a boat. 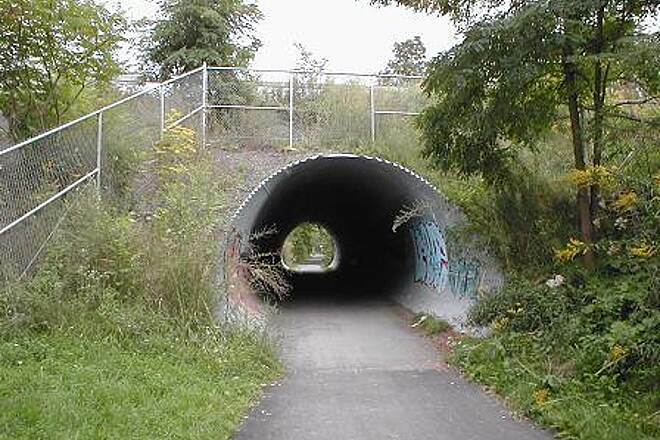 Many of these low bridges can be found in the central part of the trail in the Rochester area. The bridges, which are just a few feet above the water, required passengers to duck as memorialized in the popular folksong, “Low Bridge, Everybody Down,” written in 1905. 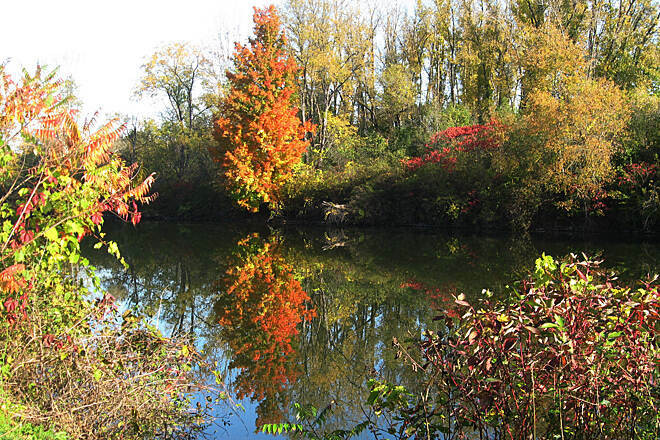 On the south side of Rochester, you’ll find another of the trail’s gems: Genesee Valley Park. The 800-acre park was designed by Frederick Law Olmsted, the famous landscape architect who helped create New York City’s Central Park. 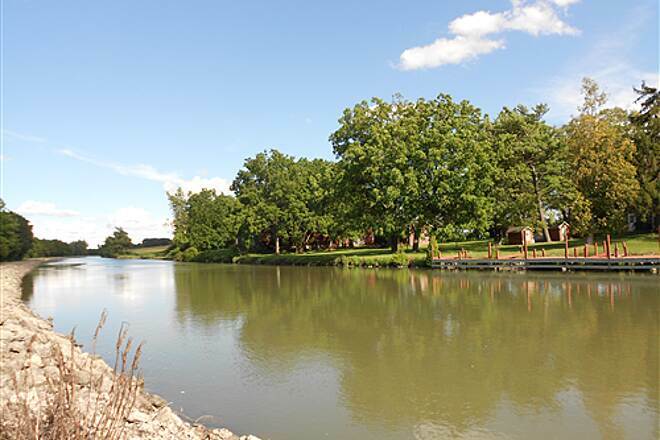 Recreational opportunities abound here, including golf, canoeing, kayaking, fishing, cross-country skiing, picnicking, softball, and soccer. There’s a 30-mile gap in the trail between Lyons and Port Byron, where the trail picks up again. 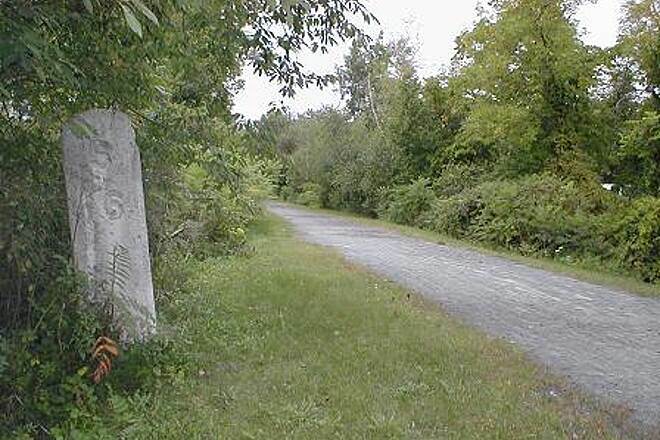 From Port Byron to the outskirts of Syracuse, the trail stretches about 20 miles. 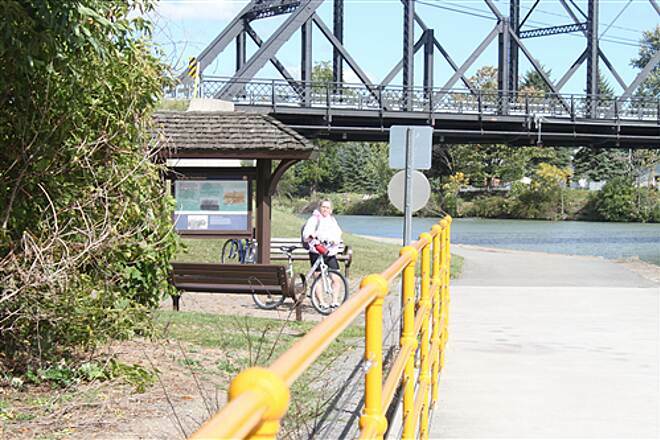 As the trail approaches Syracuse from the west, the Camillus Erie Canal Park is a notable attraction. 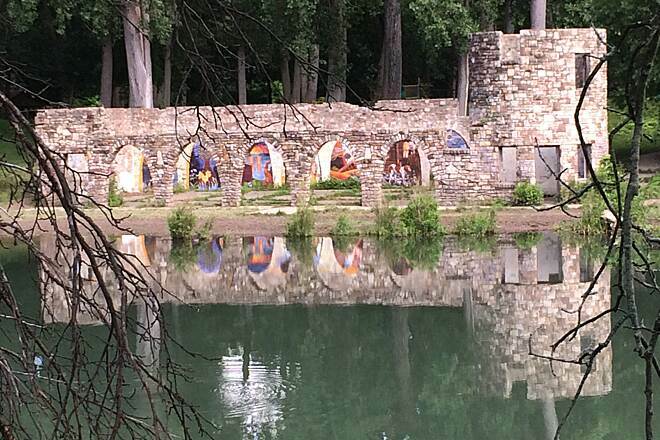 The park includes the stunning Nine Mile Creek Aqueduct, listed on the National Register of Historic Places, and Sims Store, a replica of a mid-19th-century store that serves as a museum and gift shop. 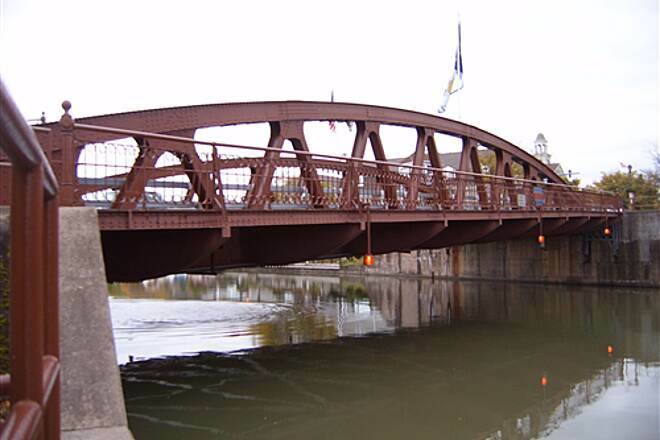 Those interested in learning more of the corridor’s history, should also explore the Erie Canal Museum in Syracuse. 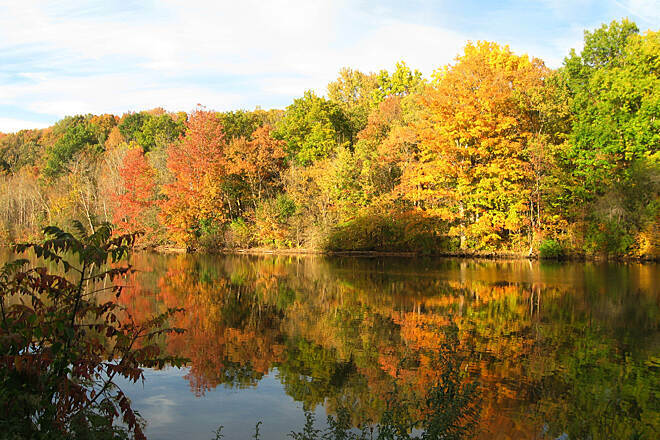 There is a 12-mile gap in the trail across Syracuse, but the trail continues east of the city, where you'll soon come to Green Lakes State Park. The park, sprawling nearly 2,000 acres, makes for a pleasant excursion. It's centered around two beautiful blue-green lakes that are open for swimming and boating, and there are hiking and camping opportunities in the park’s lush forests. This eastern section of the trail—spanning more than 50 miles through Chittenango (hometown of Wizard of Oz author L. Frank Baum), Oneida, Rome, and Utica—is one of its most picturesque with the Adirondacks to the north and the Catskills to the south. 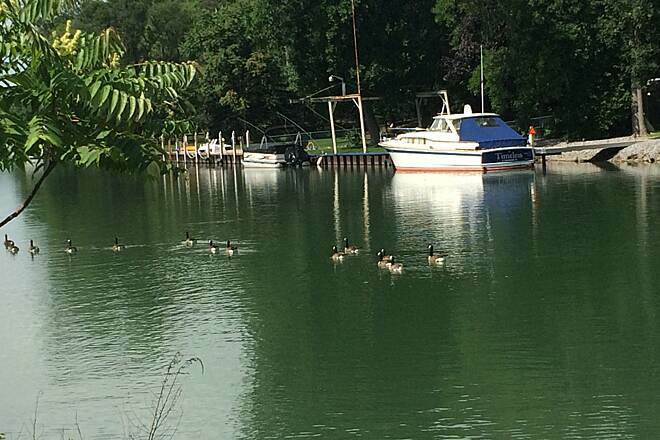 In the early 1800s, a critical component of the Erie Canal was its passage through Mohawk Valley, a natural break in the mountains that separated the busy Eastern Seaboard with the country’s developing interior. 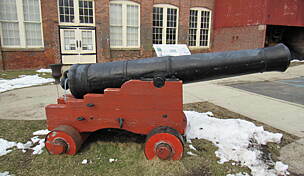 A popular stop here is Fort Stanwix, where you'll find American Revolution-era costumed guides who provide a glimpse of life in the 18th century. 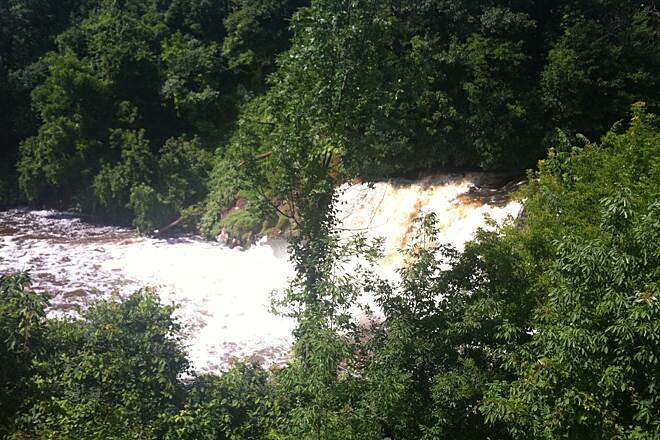 A gap of about 20 miles lies between Utica and the final leg of the trail, which picks up in Little Falls. 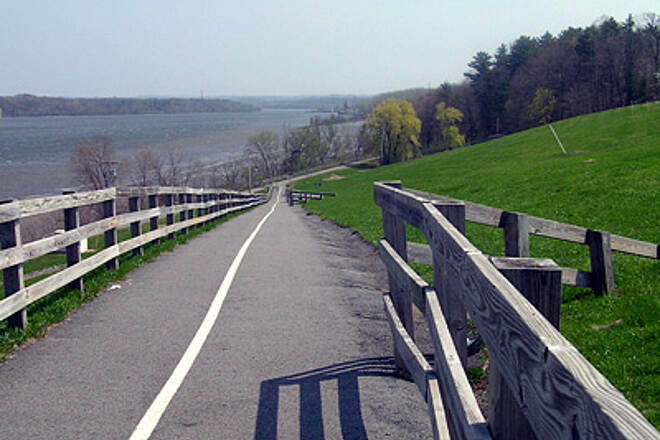 Between Little Falls and Albany, this section of the trail—also known as the Mohawk-Hudson Bikeway or Mohawk-Hudson Bike Trail—stretches 39 miles and is paved with some on-road connections. In Schenectady, you’ll enjoy the tree-lined Stockade Historic District with restored 17th- and 18th-century homes and churches along Union Street. 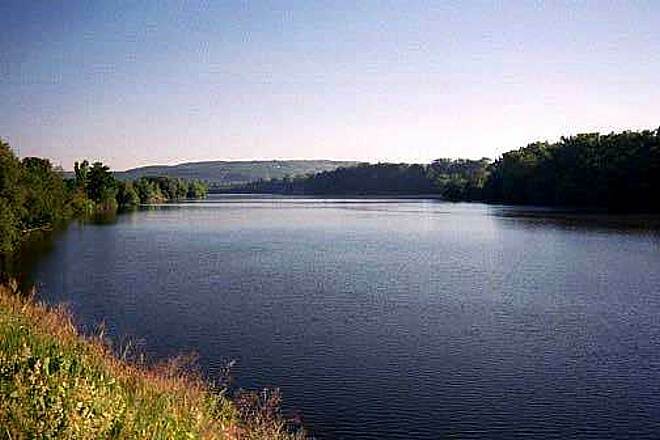 Continuing east, the trail goes through the town of Colonie, which offers a pleasantly wooded interlude, with undulating lowlands and small hillsides as it runs along the Mohawk River. 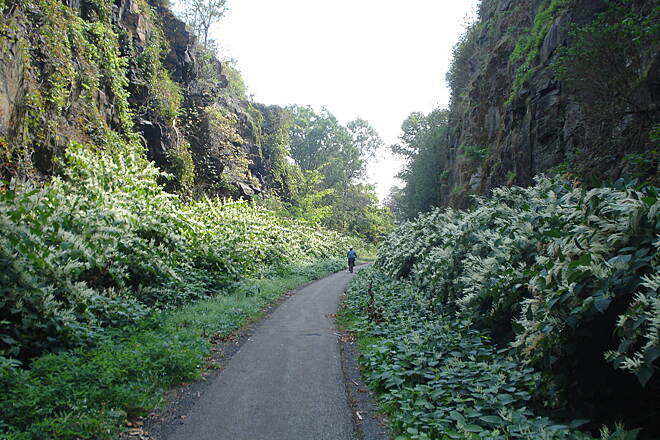 The Canalway Trail leaves the Mohawk Valley in Cohoes and turns south into the Hudson Valley. 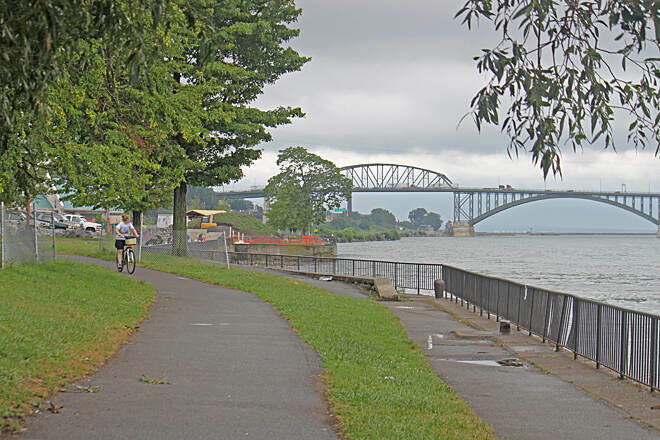 As the trail approaches its end in Albany, it runs through woodlands along the Hudson River and connects with the city’s popular Corning Riverfront Park. Continue south through the Corning Riverfront Park and use the bike and pedestrian overpass to visit downtown Albany, including the State Capitol building. 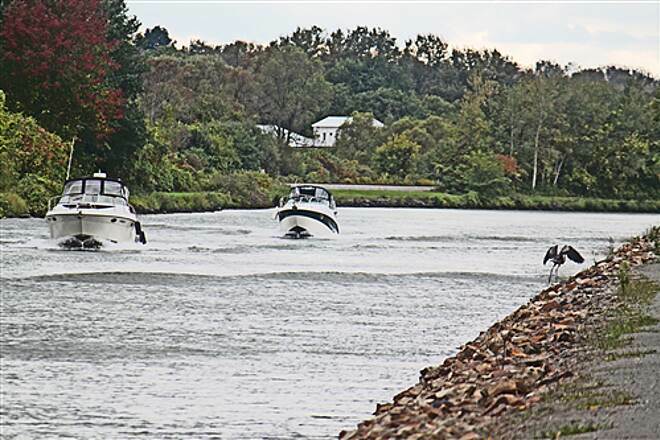 As the Erie Canalway Trail passes through more than 200 communities, there are a considerable number of access points and places to park. 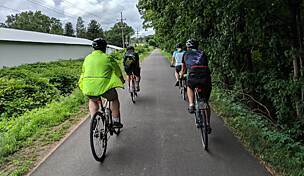 The Parks & Trails New York’s CycletheErieCanal.com website offers comprehensive details about parking and other amenities. 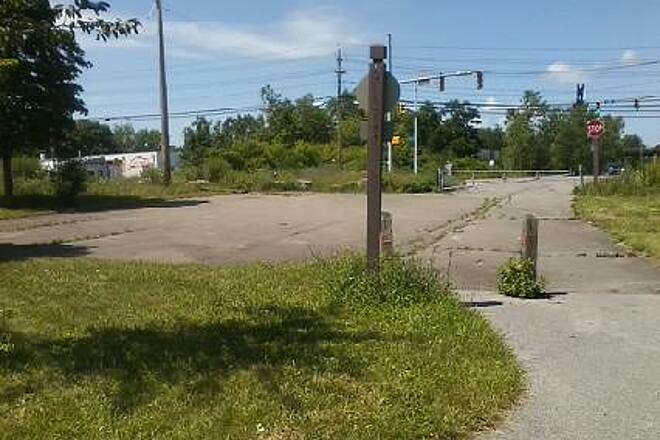 On the west end of the trail, parking is available in Buffalo’s LaSalle Park. To reach the park from downtown Buffalo, take Niagara St. north to Porter Ave. (1.2 miles from City Hall). Turn left on Porter and continue 0.5 mile to DAR Dr. 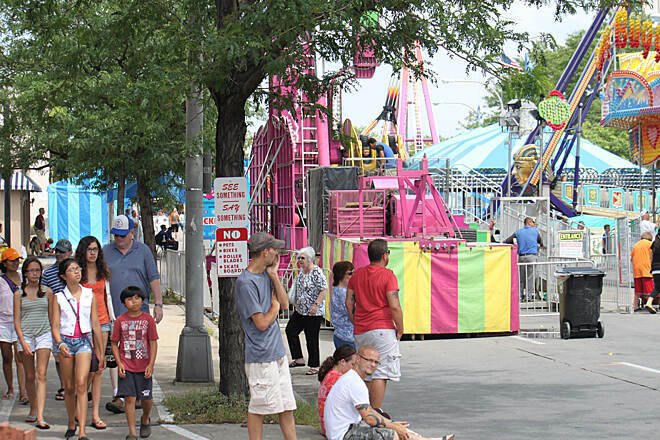 Turn left and travel 0.3 mile to the LaSalle Park parking lot, which will be on your left. The trail borders the park along the Lake Erie waterfront. 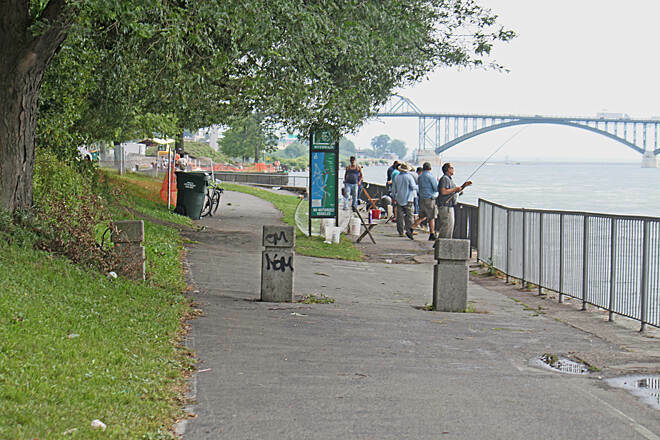 On the east end of the trail, parking is available in Albany’s Corning Riverfront Park. From downtown Albany, take State St. east towards the Hudson River waterfront. At Broadway (0.3 mile from City Hall), turn right. 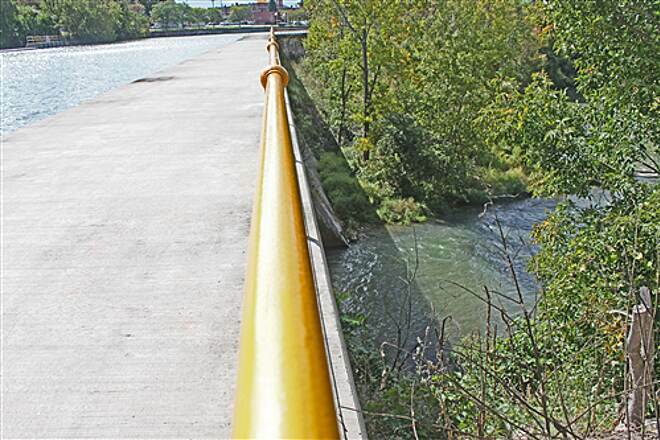 Continuing on Broadway, you will see an underpass for I-787, which is signed “Hudson Riverfront,” in 0.2 mile. 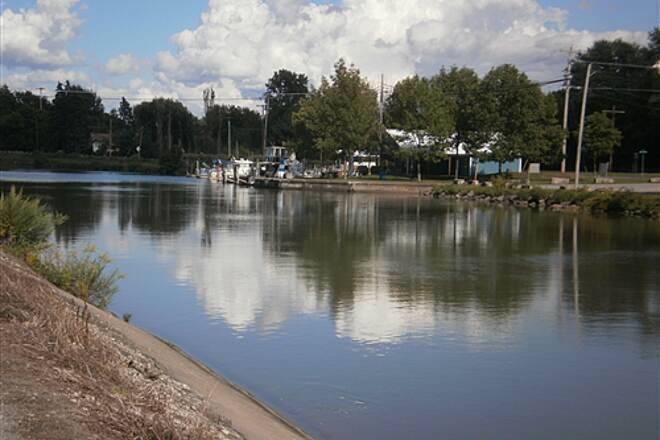 Head under the interstate to reach Quay St. in less than 500 feet. 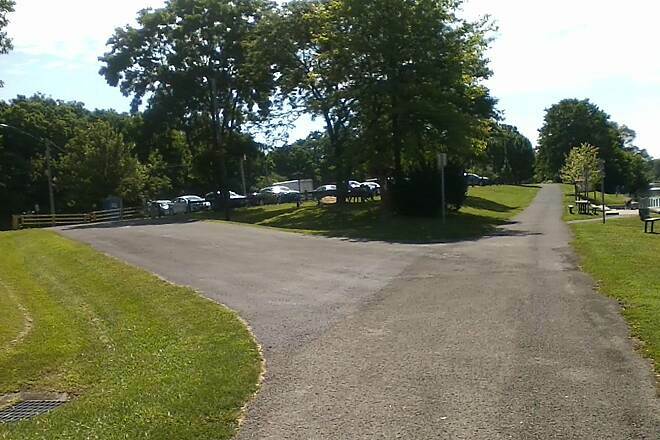 Turn left on Quay and follow it for 0.6 mile to the parking lot for the Corning Riverfront Parks and Albany Rowing Center Boathouse, which will come up on your right. The trail borders the parking lot on the side closest to the river. 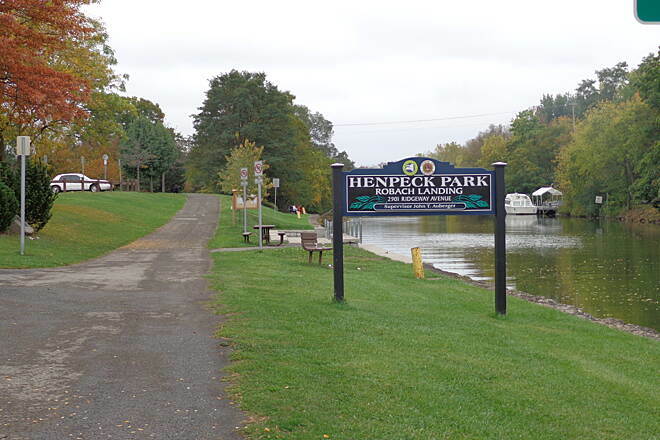 We parked at Lock 32, and rode west to Henrietta Rd (we were going to Genesee Valley Park, but trail closed at Henrietta Rd for bridge construction). Then turned around and went east to Fairport. 26miles roundtrip. Trail is paved, flat, and in good condition for most of the way. 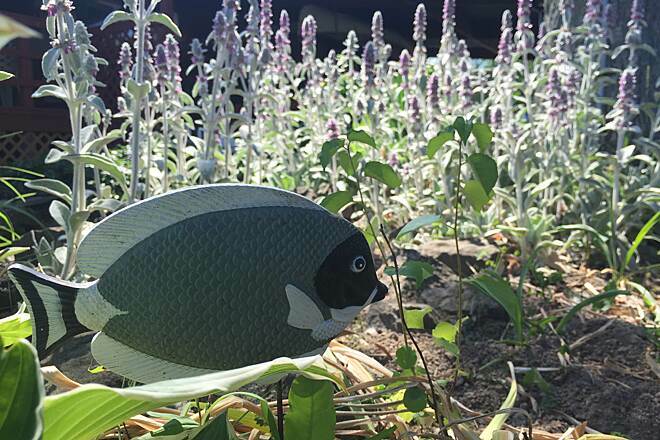 Since it is along a canal, it is open with little shade. Tough on a windy day. 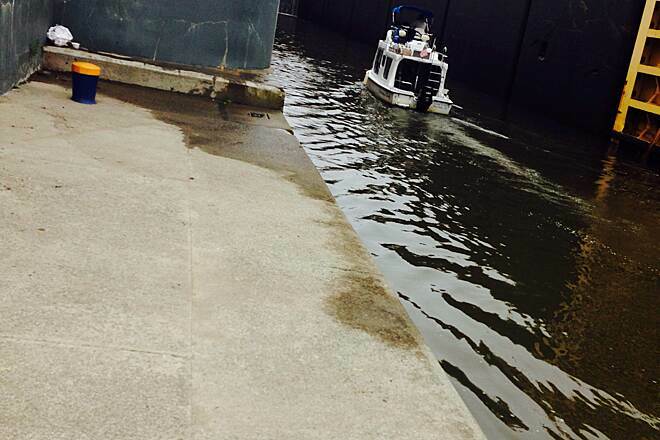 There was a portapotty at Lock 32, but no other restrooms or water that we saw. Lovely ride along the river. We did two sections of this trail, basically the eastern and western most ends of it. 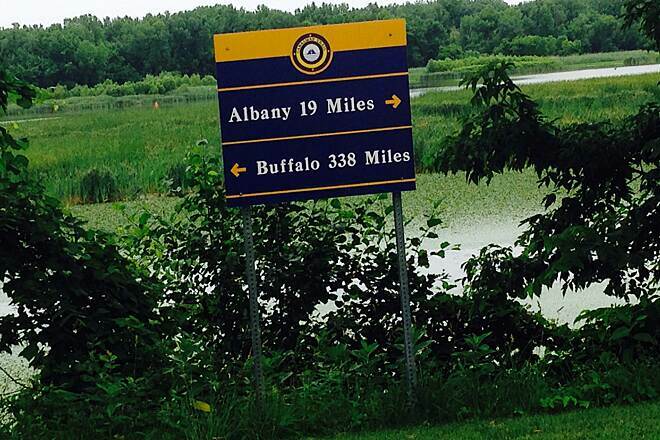 First from Buffalo to Tonawanda and then from Albany to Cohoes. 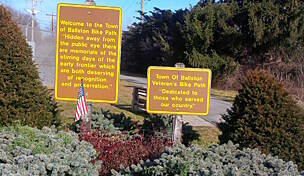 Both ends were pleasant, easy and picturesque riding, with water views during several sections and some in-town connections that were well marked with signs to keep us on track. The Buffalo end along the Niagra River had a few places where you can stop for lunch and restrooms. We also enjoyed the Canalside area of Buffalo, where we stayed at a hotel very near where the trail begins. This end had an area of the trail closed for constrction during our trip, but the detour was well marked. The Albany end of the trail was a bit more urban, with the city on your left and the river/canal on your right as you head out. We enjoyed the architecture of the city buildings and bridges, the several parks and placarded areas which highlight the history of the area, and describe the former uses of the old, rusting remains of railway and canal equipment you pass by. There are many places to stop and eat your lunch, whether that be a picnic you packed yourself or a canal side restaurant where you can shoot the breeze with locals and other cyclists. I highly recommend this trail. With the length, possibilities are endless and its a destination in itself. After four days cycling here, we headed south to the Walkway Over the Hudson to complete our New York cycling vacation. Gorgeous trip all around. 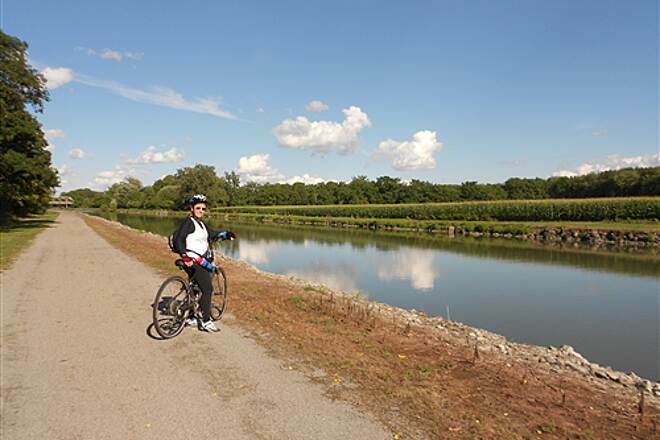 WE rode the Erie Canal trail in August 2015. It was a wonderful trip. The trail was in excellent condition. The weather was perfect. The route was only hard to find through a couple of towns. We enjoyed the countryside as well as the old quaint historic towns.We found some wonderful B&Bs to stay in and everyone was so friendly! Very enjoyable and well maintained. You can go as far as you want to on this trail. Hard to call this a "trail", because it's really many bits of right-of-way cobbled together to form one continuous (eventually!) right-of-way across the state. 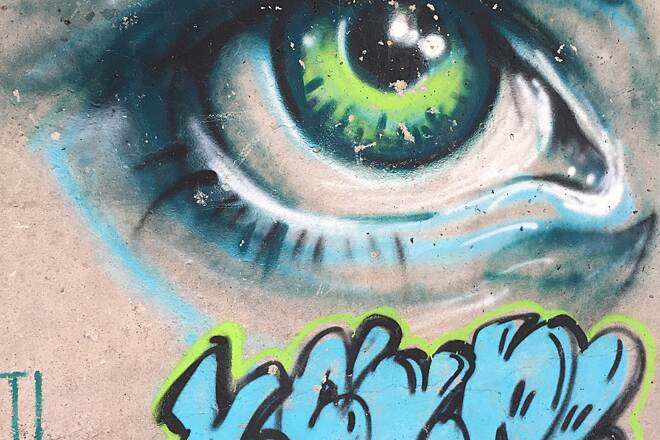 Enough of it exists that people can actually talk about "closing the gaps." 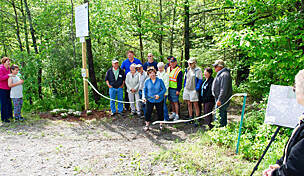 Even though this trail is not complete or entirely connected, it is still the premier trail in the state. This was my second time on this trail I parked off rice road off about a mile from lock #8 and cycled south. 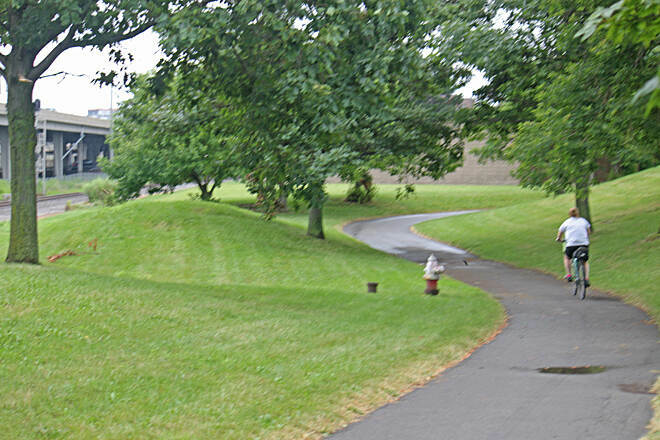 The path was paved throughout with only a couple of shady spots,it went thru schenectady and the stockade district. It was nice to see the old houses and churches alnog the way.I cycled about 10 miles south in all and more as I went sightseeing in schenectady where I stopped at an Belgian ale house named the Bier Abbey for a few libations and a snack.The beer list was extensive and excellent. I then returned to my starting point and cycled northward at that point in time it was about 90degrees out and no shade so I called it a day.Next time I hope to pick up the trail and head northward with a possible overnight stay further up yhr trail. 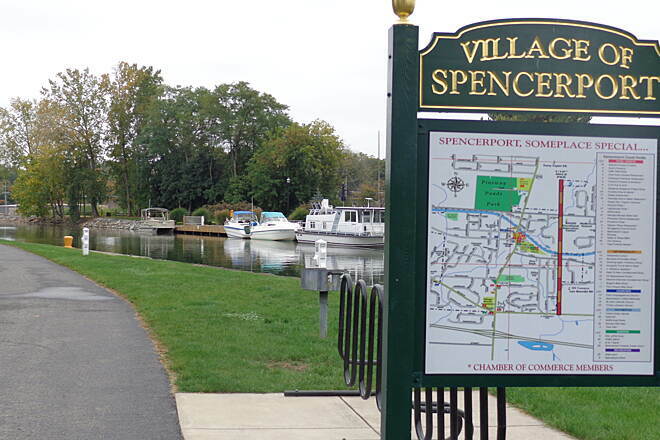 Parked at midpoint Spencerport, a neat little town with shops and eateries. Went east 7mi to I-490. Mostly stone dust with some asphalt sections. Flat, easy ride. Mix of shade and sun along the way. One cross-over the canal at Long Pond Rd, but well marked. Then went west from Spencerport to Brockport. Similar conditions. Nice scenery. Canal is elevated in several spots. Be sure to catch the drawbridges going up and down. Trail is well maintained. Parked at Wayneport Rd. First rode 7mi west to Fairport. Path is wide, asphalt in parts, crushed stone in others. Runs in the open, right along the canal. Fairport is a neat little town with shops and eateries. Then rode east 7mi to Palmyra Lock 29. Trail is narrower, shaded, and not always along the canal. Crushed stone most of the way. Lots of things to see along the way. You can find the regulation here. Here is the response I received about the issue. Thank you for your patience in waiting for a response. 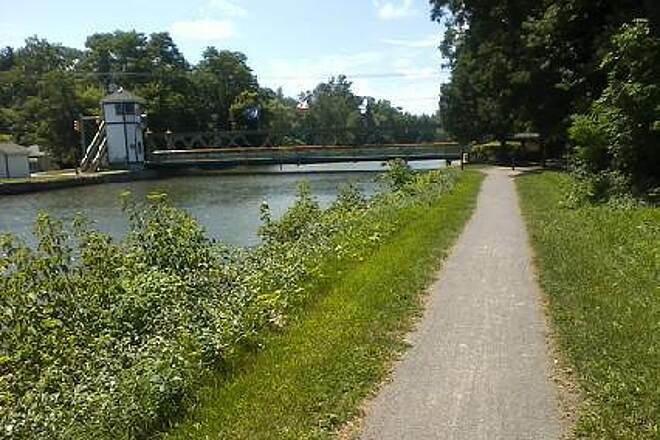 After speaking with the appropriate departments, I have been informed that the Montgomery County DPW operate and maintain this specific portion of the Erie Canalway Trail that you mention below. While horses and wagons are prohibited from using the trail, this is difficult to constantly enforce. If you or someone you know sees this kind of activity on the trail, please call the Montgomery County DPW office at 853-8155 and they will ask the County Sheriff to investigate further. If you have any additional questions, comments or concerns, you may e-mail me back at this address and I will be happy to assist you further. Thank you and I hope that you have a great day! This section is very well kept, based on my experience this late-spring. You are right along a busy road and at some point no trees just grass are between you and it, but other times it's very cozy with trees and bushes. The terrain changes between crushed very fine stone, paved asphalt, and some wooden bridges over streams. All the while it is edged by a few feet of grass on either side. The horses, which *are* permitted, according to the TrailLink site for this trail, contrary to retiredbiker's review from May 2015, sometimes are on the grass and sometimes on the gravel, but often on the grass. Just be aware that some are not as bike-savvy as others, so that can be a hiccup if you're going at a good clip in your ride. One downfall: They're doing construction on the pedestrian/bike bridge and there's a detour to route the path on the vehicle bridge, but you actually keep on the left shoulder of that bridge as opposed to the usual laws of mixed traffic when going East, so heads up and hopefully that's fixed soon! My biking friend and I started a self-contained bike ride in Fairport, NY and took Canal to the Peace Bridge. Surface was great (we did C&O last year and this was much easier) and loved that we could stop in so many small towns to check out life. We stayed in a hotel outside of Buffalo and had some problems finding our way around because the Ferry Bridge on Squaw Island was closed for repairs - thankful I had taken the time to put our ride in Ride with GPS so we could find our way on the side roads. Negative - We had a broken spoke and had to go almost 20 miles to find a bike shop so that was a slow section. We spent a few hours in Lockport and took the Lockport Underground Tour. 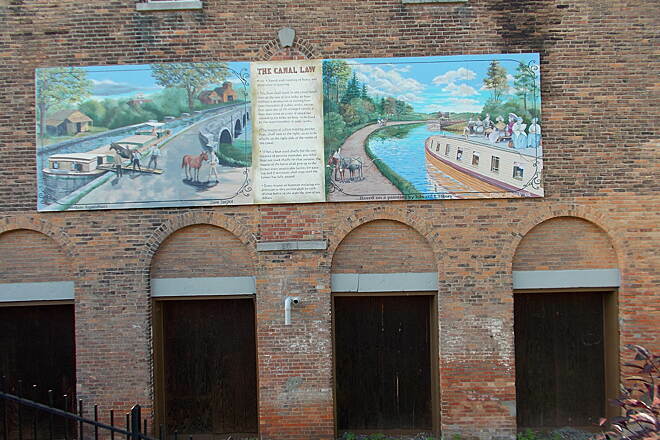 Very informative and a great way to learn about the locks/canal. 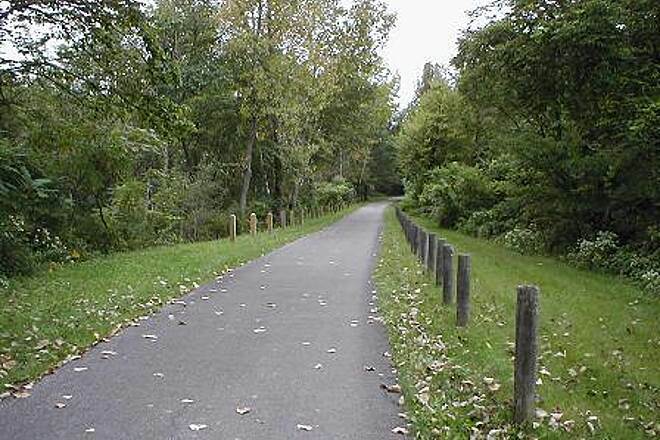 The paved portions of the trail in Montgomery County are beautiful and a joy to ride on. 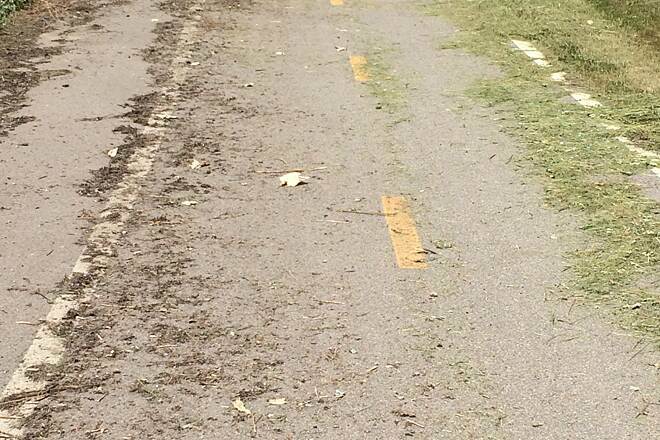 The unpaved portion have been taken over by horse and wagon leaving a very unsafe bumpy and rutted ride. The surface is in great need of reconditioning. The piles of manure make it unsanitary and unpleasant. Horses are prohibited but there are no signs to that effect. Complaints to the Canal Corp. fall on deaf ears. 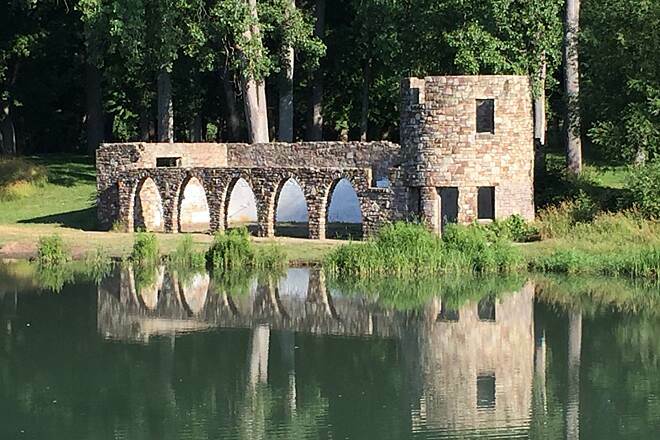 It is sad that a beautiful New York State resource is so neglected in Montgomery County. Dirty! 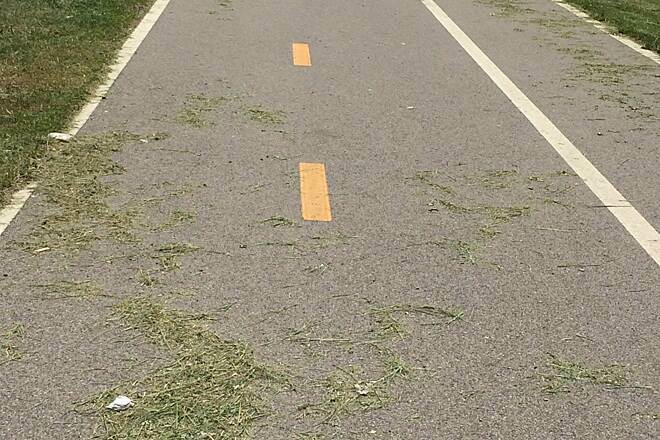 Grass clippings, shredded pop bottles and a dead rodent on the pathway. We turn back before we reached Ontario street. Don't use this section if biking or rollerblading. Skied this trail yesterday from Weedsport to Port Byron and back (4.6 miles total distance). Level, well-maintained trail - supposedly closed to motorized vehicles, but we had to work around snowmobile tracks for the eastern third of the trail (Weedsport to Centerport Road). Interesting interpretive signs at either end of the the parks at either end of the trail segment. We spotted a mink or marten across the old canalway at one of our rest stops. Convenient parking at both ends of the trail. I've had to do this trail in parts and am looking forward to continuing it. Beautiful and not challenging. 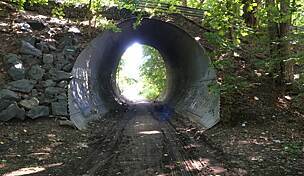 I have ridden this trail in three segments - the last segment I rode was from Colonie to Albany - The trek along i787 and the Mohawk was beautiful and brimming with history. The interpretive signs were great. This trail has some beautiful and well tended paths (especially in the north) and some urban sections with confusing and rather bumpy paths as you head further south. 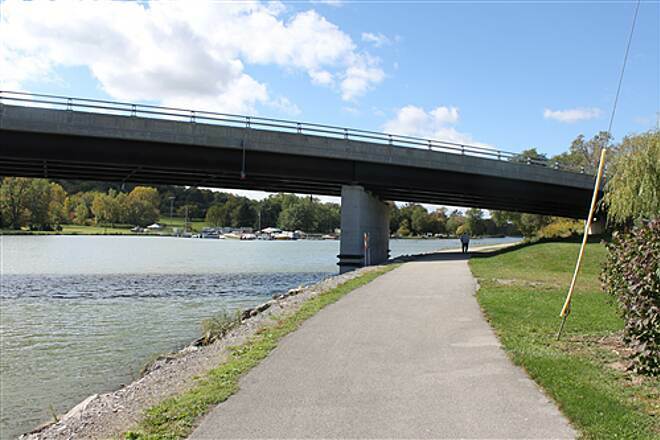 This section passes over a few lift bridges and pedestrian walkways to avoid the highway. 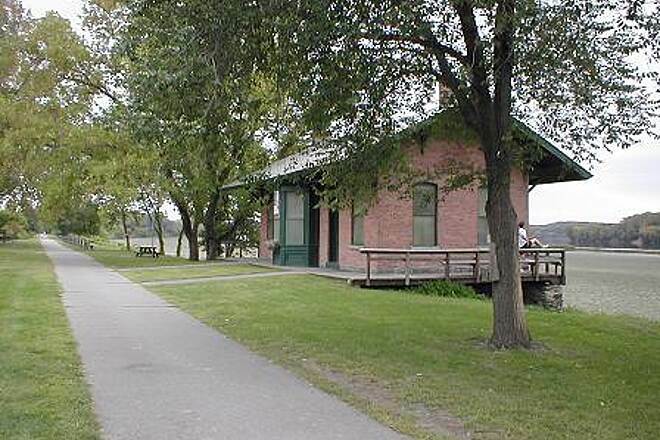 The trail passes through several parks and some historical areas. It can easily be extended at the southern section to include the Erie Basin Marina and watchtower. If you like city biking and city parks, stay south. 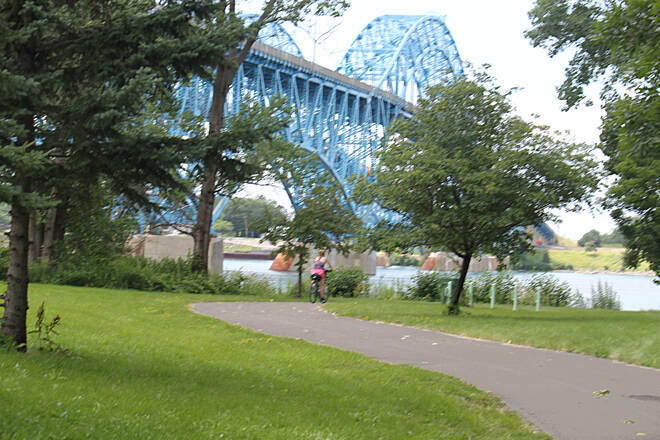 If you like more peaceful paths along the river the northern section above the Grand Island bridge can't be beat. The middle section through the industrial area is not very attractive at all. Overall, a nice mix of a lot of different rides and worth a nice morning or afternoon. Is it for ATV,s also?? The scenery couldn't be better. Riding along the Niagara River to the entrance to the Erie Canal on a warm sunny day was great. 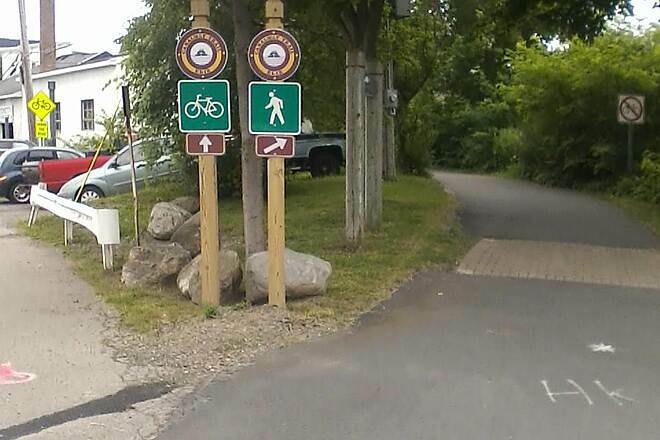 The trail itself needs better signage so you don't stay on a busy urban street instead of riding the path along the river. We'd still advise anyone to give it a try but be prepared for some moments of confusion with finding the correct path. 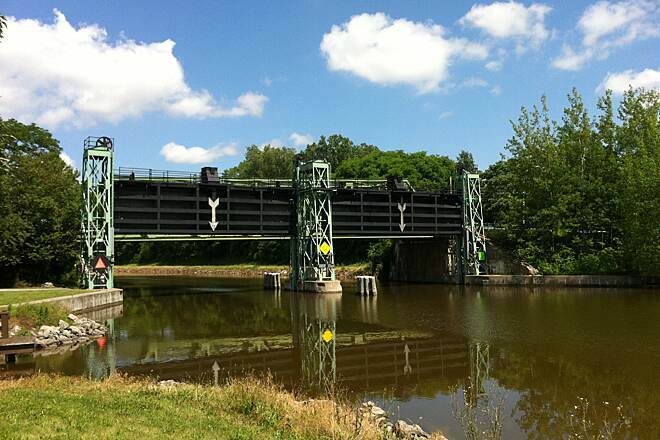 Two words of caution: the Ferry Street bridge which takes you to or from Squaw Island is a metal lift bridge that can be treacherous to negotiate. 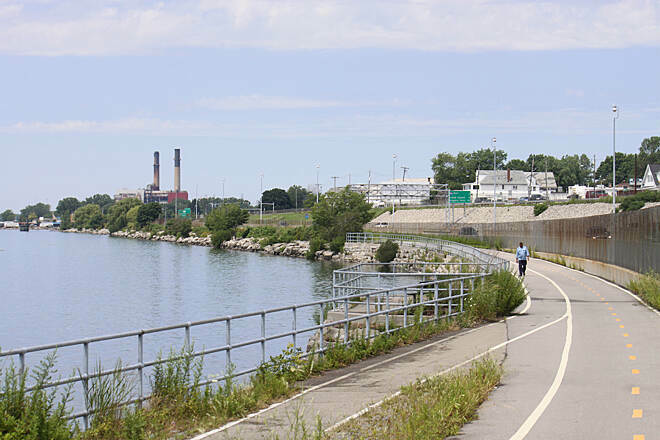 At Porter Avenue and LaSalle Park, there is a sign that says Bike Path ends. The problem is that is where the River Walk starts but there is no indication that is so. It would be very helpful if the Trail lLink map was interactive.so when you are using your iPhone to solve this problem, you could touch the location arrow and see exactly where you are. I'm being picky but a beautiful ride like this can be spoiled by the little problems. 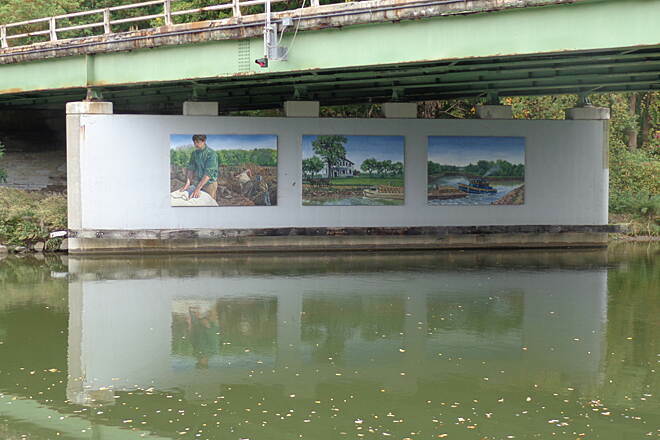 Took the Erie Canal Trail from the city of Newark to Pittsford on a Performance Hybrid Bicycle with some friends. Some of the trail could support a Racing bike, but probably would not recommend it as some are areas have soft stone or mud from being washed out by all the rain. Stopped at Fairport Brewing Company just off the Canal and enjoyed taste testing their Nano-Brewing beers on tap. Finished the ride in Pittsford and enjoyed lunch at the Aladdin Restaurant (20 miles one way). The trail is crushed stone, paved in city areas and was a beautiful ride along the canal and through the parks and towns. There were plenty of maps and markers to show the route. I saw a lot of families with their children out enjoying the trails on bike, running and walking. 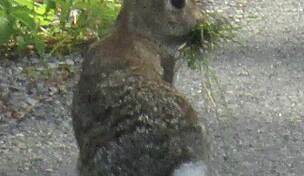 We did run across some deer, wood chucks and lot of birds. Definitely worth exploring and looking forward to exploring the other sections of the Canal. Lot of picture taking opportunities. 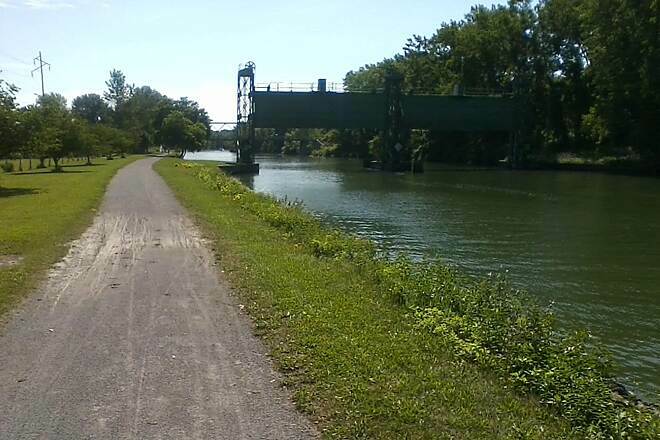 Took the Erie Canal Trail from the city of Pittsford to Brockport on a Performance Hybrid Bicycle. Some of the trail could support a Racing bike, but probably would not recommend it as some are areas with soft stone or mud from being washed out by all the rain. Stopped in Brockport to enjoy lunch and drinks at the Stoneyard Bar and Grill before heading back to Pittsford (26 miles one way). 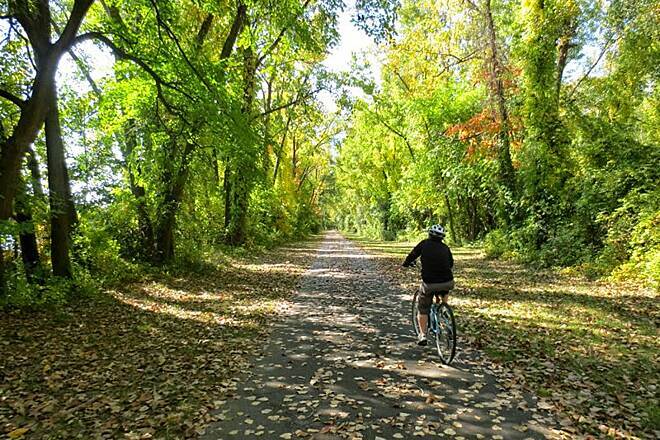 The trail is crushed stone, paved in city areas and was a beautiful ride along the canal and through the parks. There were plenty of maps and markers to show the different routes. I saw a lot of families with their children out enjoying the trails on bike, running and walking. We did run across some deer, wood chucks and lot of birds. Definitely worth exploring and looking forward to exploring the other sections of the Canal. Lot of picture taking opportunities. I rode this today and was going to try and make it to the next town but, i only made it from Tonawanda to Madina, all in all did 90 miles. the trail was scenic and smooth (for being crushed stone) lots of bridges to see along the way. I can't wait to ride this trail again with a group and go even further! The description needs some updating. The entire trail is paved asphalt now, suitable for road tires by and large. There are some sections that get a little less maintenance than others, so you'll encounter some spots where tree roots are breaking through the pavement, and others that have some road dust swept onto it. No glass thought, just the grit from the road. Part of the trail butts against the water front, some other parts veer away from the waterfront a bit. Very scenic, speed limit of 15mph (No Pathletes), there are some dog walkers and peds, so caution should be advised. 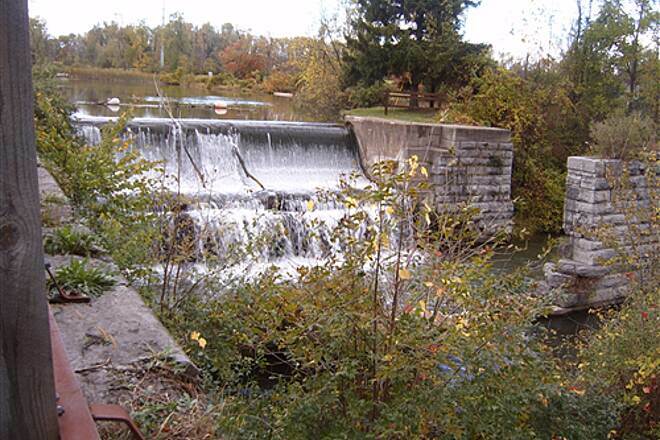 We rode in early May and started at lock 16 in Mindenville and got just past the Little Falls boundary heading west. 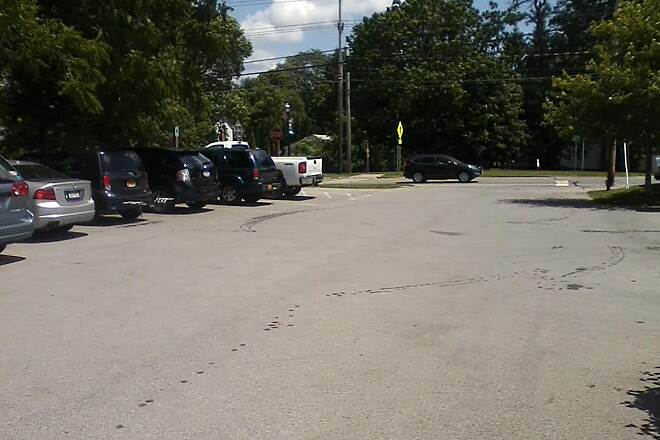 Lock 16 has about 8-10 parking spaces, but wasn't full. This is a great section of trail; a bit on the Mindenville end is next to the Thruway, but still worth it. 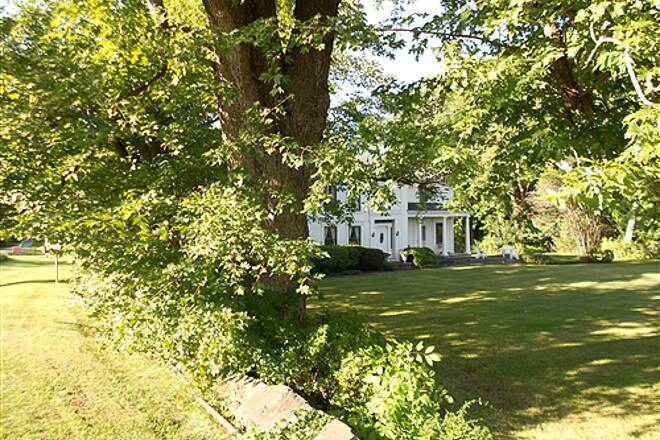 The Herkimer Home is kind of cool and would be another good place to park. Most of this part is unpaved, but still smooth (fine gravel dust). 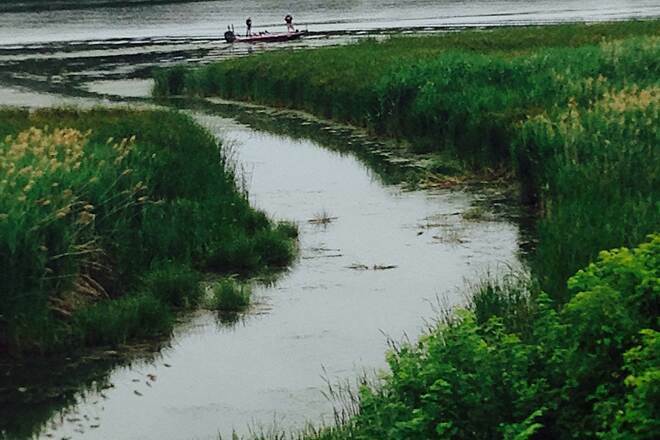 The only rough patch was about 1/2 a mile west of Lock 16 where the trail was washed about for about 30 feet. It was spring, though, and this was easy to get around. The section near Little Falls is really spectacular, it's on a cliff overlooking the river. I've done only part of this trail, but it's amazing. And the best part is the length. what other state can claim a trail that is 365 miles long? And everyone things NY is city and NC is rural. well just check it out. Believe me, I live in NC now, and there are almost no bike trails at all!!!!!!!!!!! We started this one on the Little Falls end. There was a small parking area behind some apartment houses at the trail endpoint. This part of the trail is paved. Initially it goes through a section that must have been blasted out to make the rail bed, so you are traveling between cliffs. It also goes through a tunnel before getting to Lock 17. At Lock 17 there is a little park that is accessible via a ramp that goes back and forth down to the bottom of the lock downstream, if you care to go down. As you continue down, the trail crosses a few roads and eventually changes to packed gravel, still good for biking. It goes by the historic Herkimer House. There is a bike rack at the gate, which leads into the grounds. A little further on, there was a tractor crossing where we stopped and watched some large farm equipment pass. Your aren't close to the canal itself at this point, just going through farm land. We only went as far as Canal Lock Road, almost 5 miles. We actually started at a point beyond what is shown here as the end point in Utica. We parked at the commuter parking lot off N. Genessee St. on Harbor Lock Rd. 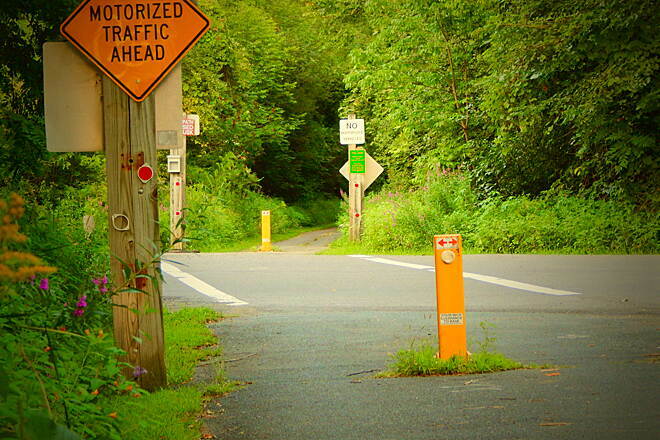 The bike trail seems to begin here, and is paved at this point, all the way to Lock #20 (about 4.5 miles). You can see the canal pretty much that whole way, although sometimes the trees are dense enough to make it harder to see. There are a few places where tree roots are pushing up the pavement making small "speed bumps". It is fairly level. About 1/2 mile in, you have to cross over a small lock. You have to walk your bike over the causeway. Its kind of neat. At one point you have to cross active railroad tracks. There are signals. Its rough there, very loose gravel. I would recommend walking the bike through this part. After that you have to go through a mostly gravel parking area and pick up the trail again on the far side. 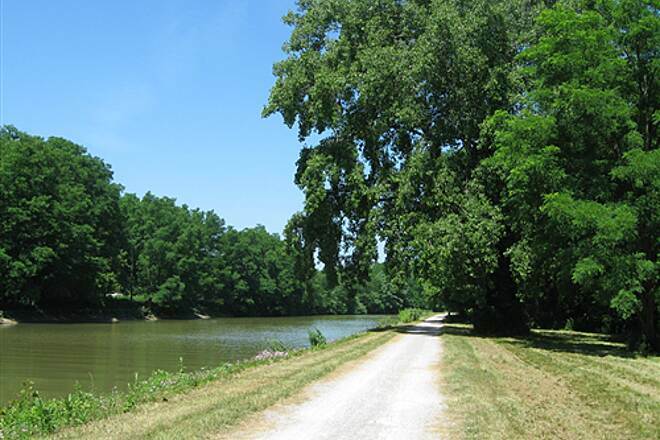 When you get to Lock #20, there is a state park there, with picnic tables and grills and some camp sites. If you cross the lock there are restrooms on the far side. Its a nice park, maintained by the local Order of Moose. Beyond the park the trail continues on but the surface here turns to crushed stone/gravel. It is still well packed and easy to ride on. A wooden bridge crosses over a dam that spills into a connecting creek. Once you cross under the bridge at Onskany (now 7 miles from the end point) the canalway trail apparently swings away from the canal and follows the road for a bit. We didn't have the map with us and the signage did not indicate, and it appeared the trail continued along the canal, so we went that way. It soon turned into a single track path, and was muddy, rocky, grassy, not suitable for the bikes we had. A mountain bike would probably do OK. I don't know how far it goes. We only went about another half mile then turned around and went back. We did not go up the road so I can't say how the rest of this trail went, but the part we did was pleasant enough and not too difficult. We rode this trail from Lockport to Medina and back (about 35 miles round trip) on our hybrid bikes and really enjoyed it. Spent the night before our ride at the Holiday Inn Lockport, which was very clean and comfortable and only about 2 miles from the trail. We got on the trail at its starting point at the locks in Lockport after watching a couple boats go through the locks. The trail is mostly crushed limestone packed but in very good condition...but very little shade! Nice picnic area in Gasport where we took a short break and watched the bridge rise to let a boat pass under. As the trail follows right along he canal, we saw numerous bridges, but only saw one actually in operation. Restrooms are scarce along the trail...you have to go into one of the towns and find a store or cafe that has one they might let you use. My husband developed a problem with his chain that, thankfully, wasn't anything major, because bike shops are very hard to come by! We did find a place in Medina..the Candle Nook...that rents bikes and the owner, Mark, has a repair shop in the basement of the building. He helped us out with repair of the bike, then sat and talked to us while we ate some ice cream and got a bottle of water (both of those are also available at Candle Nook)--and used his restroom. We turned around in Medina and headed back. Tomorrow we'll go round trip from Medina to a little past Albion before heading back home. My wife and I just spent several days on the Canalway. We really enjoyed visiting all of the "ports"-Lockport, Gasport, Middleport, Spencerport, Brockport and probably a couple of more that I forgot. This trail was on our "bucket list" and we really enjoyed it. Left the car at the Canal Park in Newark. This was our first trip carrying our camping gear on a trailer. Although the trail is primarily flat, the intersections with main roads have considerable inclines. This later became a challange due to our overloaded trailer (lesson learned). The trail from Newark to Palmyra has the most hills and is challanging to inexperianced riders with heavy loads (us). The community park in Palmyra is very attractive and even has showers in the public washrooms. 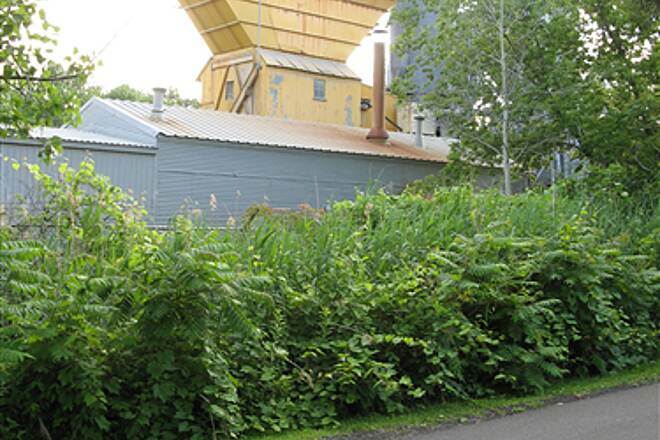 A word of caution in Fairport is to get off the trail as you approach route 250. We did not and came upon stairs without warning. Perhaps there was a warning but I was distracted when someone stepped infront of my bike and had to stop suddenly causing me to loose some of my gear off the trailer. 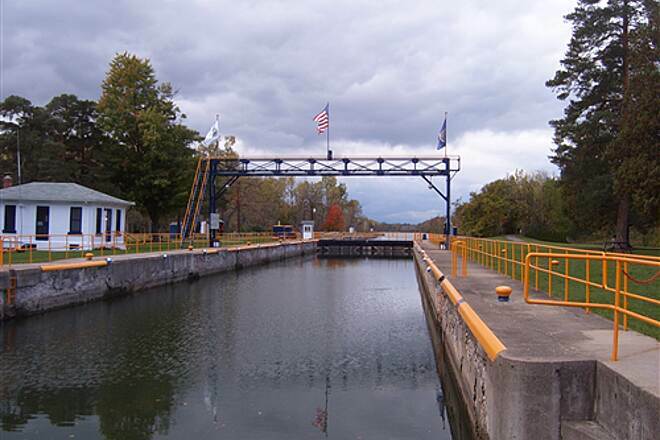 We asked the lockmaster at lock 32 where we could pitch our tent and he directed us to an out of the way spot. He even offered his restroom if we need it. This was a great location for an over night stay since there is a mall and restaurants near by. There are a few stretches of pavement but the longer ones are prone to upheaving due to tree roots which are hard on the bike and trailer. All in all this is a good trail. Had a great time riding the length of the trail. The surface was great most of the time. 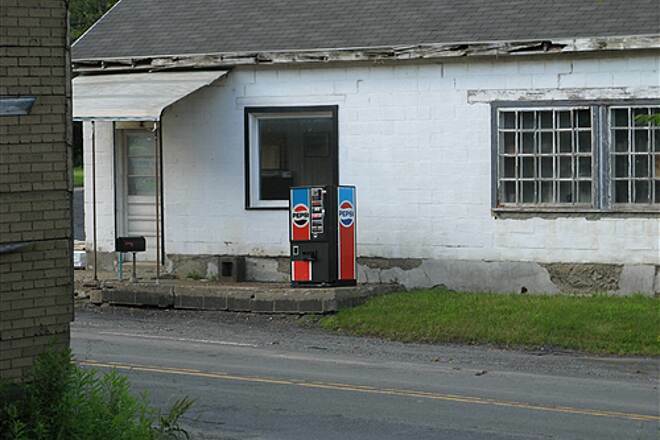 The section from Lockport to Brockport didn't have any water or bathrooms unless you went into a business. But it is fun to get off the trail and ride through the towns. After you get to Brockport there are more facilities and more food options too. 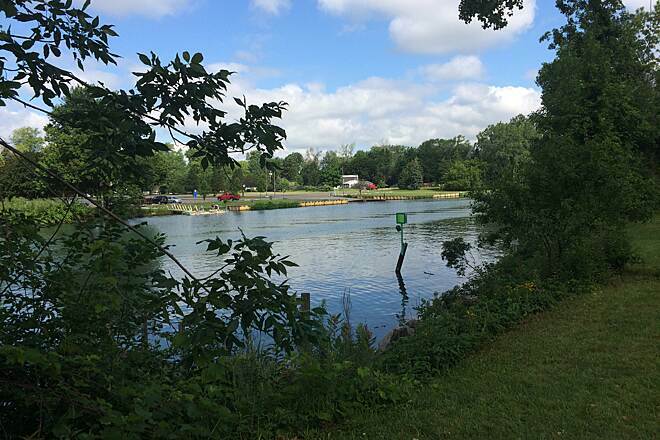 You have to pay attention around Rochester to make sure you stay on the correct trail since there are several trails that intersect the Erie Canal trail. Pittsford is very busy but makes a good food stop. Another trail fact - the wind always blows from the west so keep that in mind because the trail is very open most of the way. I'm rating the trail only 4 stars because it isn't paved the entire length otherwise it is a great trail. The trail no longer ends at Palmyra, after crossing over to the other side of the canal the path continues another 7 miles or so to Newark NY. 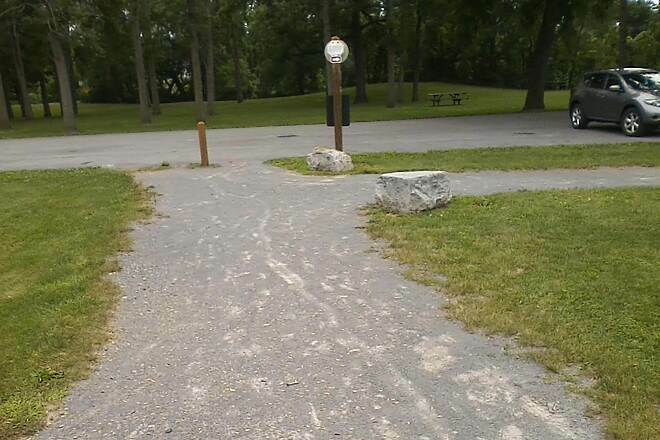 We rode the entire trail from Lockport to Newark (111 miles) in 3 days this past July (2010), the trail surface is either stone dust or asphalt the entire way, so there are no need to bypass any section via roadways. The new extension into Newark isn't as level and straight as the rest of the towpath as it zigs and zags to and from the canal; this provides a welcome change of scenery after a couple of days of riding with the canal by your side. There is legal overnight parking in Newark (Lot C a couple blocks from the canal) where we parked our van. The journal of our tour on the Trail can be found on crazyguyonbike.com at this link: http://www.crazyguyonabike.com/doc/ErieCanalWest2010 The journal contains the particulars of lodging, logistics, etc. Our tour was loosely based on he inn-to-inn touring guide published by PCNY, the parks and canal of NY organization. Took Lockport to Gasport and was a great ride for kids with crushed stone. The parking options pinpointed on the map (mile 0 and Gasport) aren't ideal. Instead use Day Rd intersection which has picnic tables and nice parking. At Lockport, the intersection of Old Niagara Rd and North Canal Rd have nice parking around the route 5 bike route. This is a nice trail for the first 8 miles and then it turns into city streets in Waterviliet (Waterford). From there it goes about 6 miles into Green Island and then back onto the trail. I would not recommend this part of the trail for famlies with little children. Riding on the city streets and poorly marked "Bike Trail" signs made this part of the ride not very enjoyable. Lucky we had good friends to ride with and had lots of laughs. [Club Juan would have been better!!] Back on the triail, it is paved and level. It rides along the river with nice views and beautiful senery. We started in Albany and finish there. 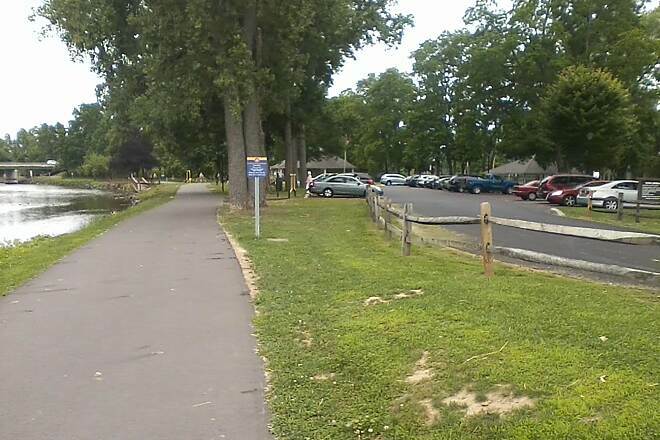 The park in Albany is very nice and has lots of parking, over by the boat launch there is more parking. The park will be a nice finish for the kids and picnic. If your with adults go ride 3/4 of a mile away and eat at Albany Pump station, great food and many types of beers. I am going back up there someday and ride form Choes to Schenectady along the Mohawk river. Hope its not on city streets!!! Ride a trail write a review!!! Before this was a real trail, this was called the 'towpath' as some of it was the old towpath that the mules and horses used to pull the boats. 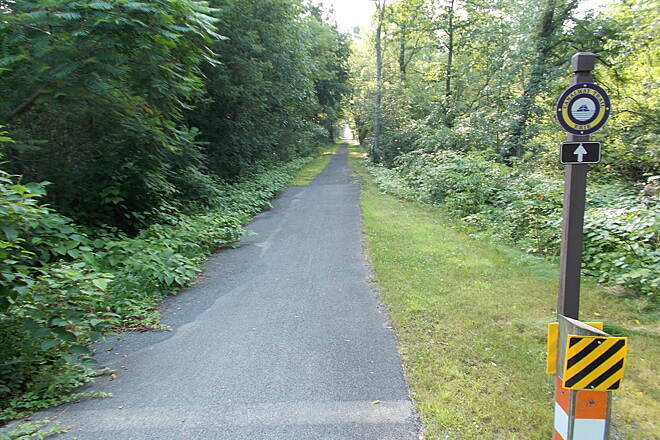 As a kid 35 years ago, i used to ride on what became this trail from Rochester to Palmyra (I lived in Fairport). 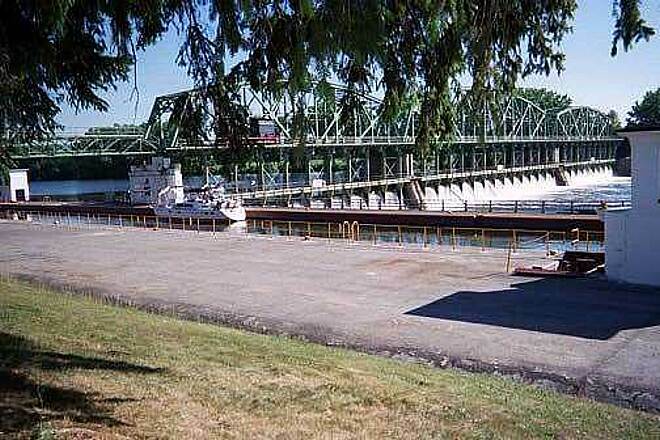 Some of it was very rough, i remember in Macedon it would detour through a trailor park and getting around the locks was not easy. Someday I hope to get back to ride the entire distance. I have great memories of this bike trail that I spent many days on as a young boy and now my daughters get to enjoy the same trails. 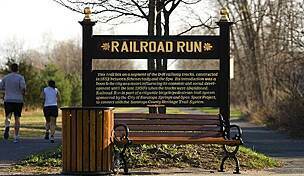 We met Susan Weaver from Rails to Trails today and that's how I found out about this great web site. I highly recommend this Bikeway! 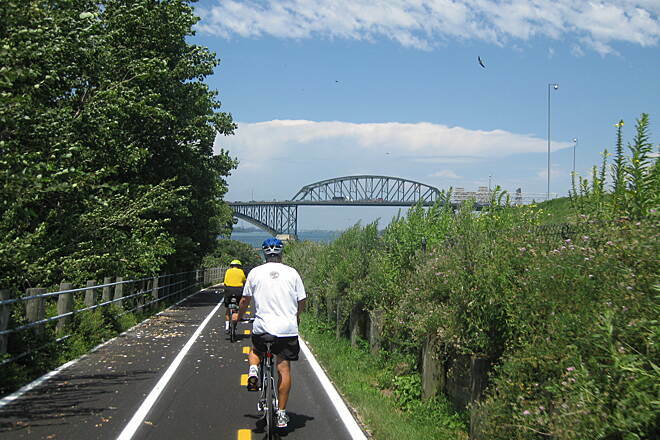 "When heading westbound on the trail, the bike route signs end on Schenectady streets. When the trail empties onto Jay Street turn left. Turn right at Union Street, left at North Ferry Street and right at State Street (route 5). Right before you get to the bridge over the Mohawk River turn right into SCCC. 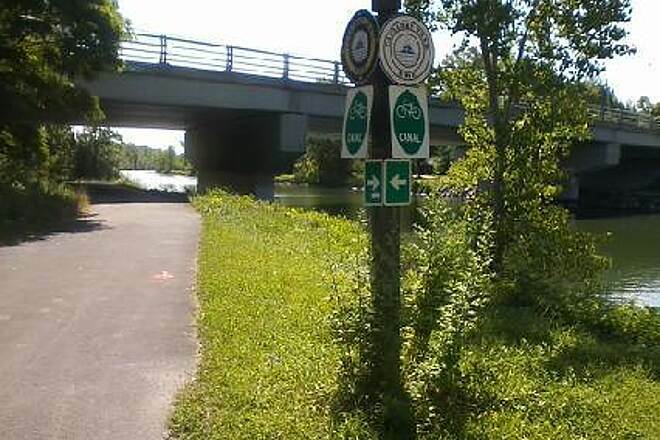 You'll go under route 5 and the bike trail rebegins on the right." 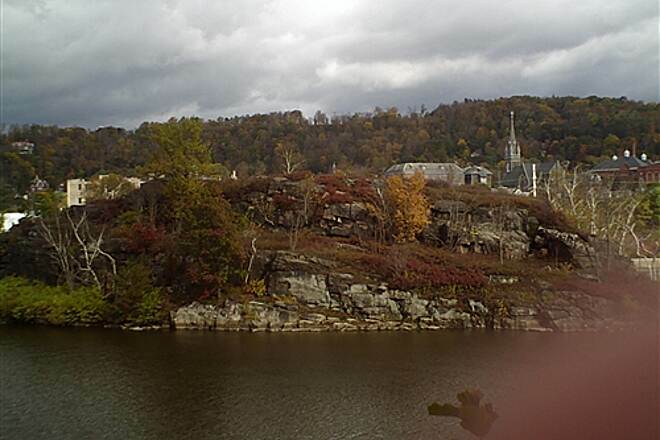 "Started at the southern end in Albany. Found the parking area without too much trouble. I would advise you head south to see the Half Moon ship docked very close to the end. The first five miles were a pleasant surprise and really a nice ride along the river. (bag) and turned around for the return trip. It took about 5 hours and would make a great one way trip down hill and if you skipped the Watervliet section one of the best rides I have taken. I think we biked about 40 miles total. " 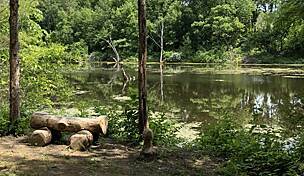 "I selected the Colonie Town Park as a starting point for my late summer bicycle ride on a segment of this very popular trail. My travels took me east to Manor Avenue in Colonie, and west to the General Electric Research facility near Niskayuna (an approximate 25-mile round trip journey). As the previous reviewer noted, trail surfaces and right-of-ways are very well maintained along the entire route. 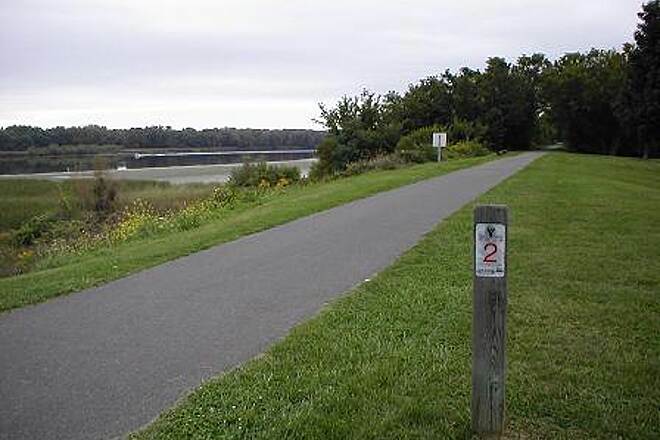 The trail surface is well suited to bicycle riding (even on a road bike), walking, and jogging. Although there is new pavement in spots, many sections of the asphalt surface aren’t smooth enough for in-line skating. There is also a 1.25-mile unpaved section in Colonie, just east of Route 9, and a 1.5-mile on-street detour just west of the Colonie Town Park. Views along my route ranged from boring to breathtaking. I found the most eye-catching scenery through Niskayuna; the least appealing was just west of the Blatnick Town Park near US Department of Energy and General Electric operated facilities. I strongly recommend you take along a copy of the official Rails to Trails Conservancy New York Guide Book. It contains all of the information you’ll need to know about parking, trail access points, distances, and attractions for this and other significant trails in New York. 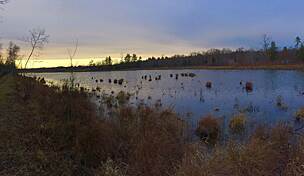 Although this isn’t the most impressive paved trail I’ve ridden on in the State of New York, its trail conditions and surroundings are worthy of traveling to from afar at least once." 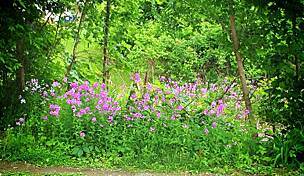 "I did a total of 15 miles (30 round-trip) of the eastern portion of the trail with two friends on July 20, 2003. The trail was well maintained and except for two small sections was very flat. Pleanty of parking available at several locations. Nice views of the Mohawk River and and we able to see one of the locks in operation. Overall, a great day and I am looking forward to doing the western portion of the trail soon." "Have ridden Lockport-Palmyra 3x. Parts are wonderful, but use NY31 from Albion to Holley if not MTB. Watch for tree root upheaval on paved parts near Rochester. 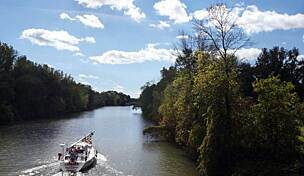 See NYS Canals page for B&B info." "Recommend MTB, soft in places." 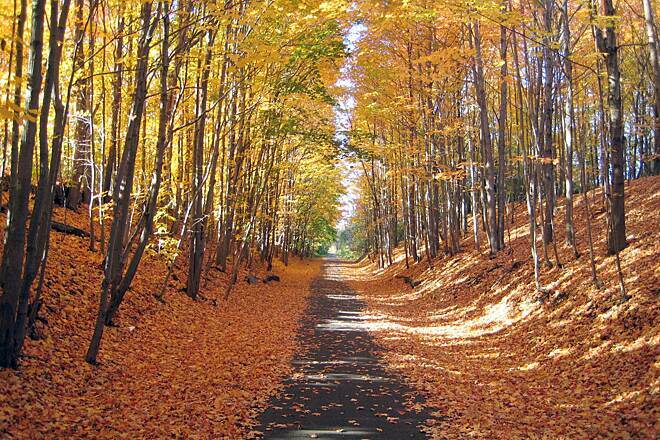 "I love this trail. W and E ends very scenic, Durhamville to Lock Rd. less interesting. See EC Village at Rome, replica bridge at Cedar Bay. Camp at Green Lakes SP, very nice park." "My then-12 year old son and I rode from Tonawanda to Palmyra in June 2000. With the exception of the Pendleton to Lockport section, where we encountered heavy traffic, the ride was safe and quiet. If there is a more picturesque setting than the Canalway Trail, I've not seen it. The flat grade may bore more experienced riders, but it was ideal for us.
" 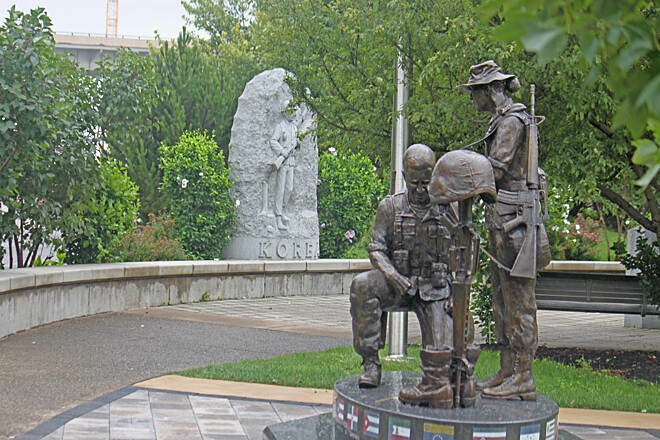 We have had the pleasure of travelling on this trail twice in September of 1999 and 2000. 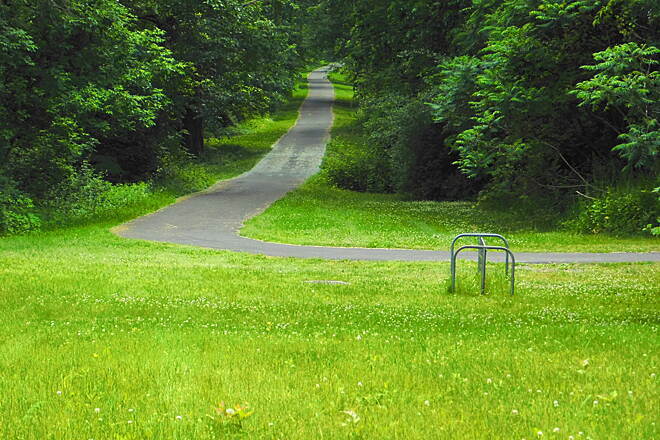 It is a flat and easy trail and ideally suited to pleasure biking. 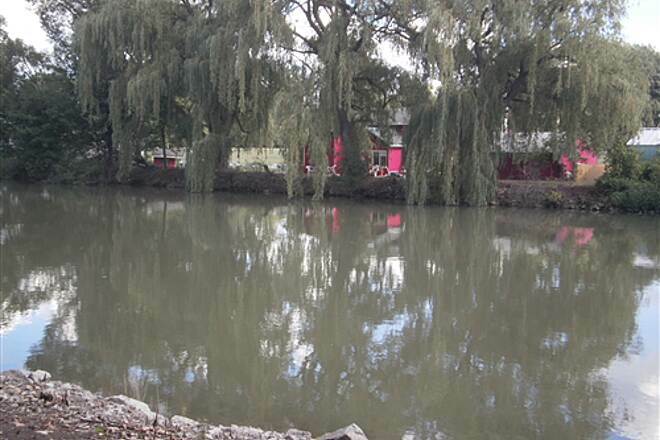 It is quiet and very interesting with all the small towns that have canalside parks and fascinating bridges. While accommodation is a bit of a challenge, it can be arranged with a bit of flexibility. 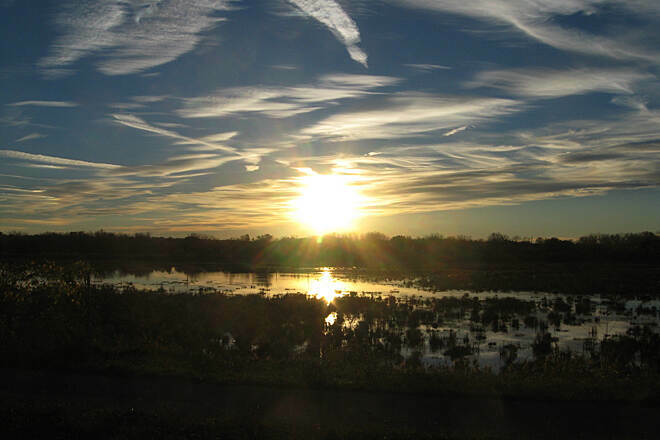 Towpaths provide the added enjoyment of biking by water, seeing a variety of boats and assorted birds."